So, despite the picture problems I’ve been having today it’s heir poll time again. From everyone’s comments so far I’m pretty sure I know who’s going to win but then again maybe you’ll all surprise me and chose someone different. I have my favourite of the kids this generation but honestly, pick whoever you want, I don’t mind. I’m going away for a week for New Year (28th Dec – 4th Jan) so the heir poll will run until I get home on the 4th. 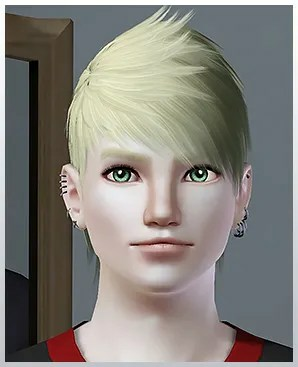 Oh, I also want to note that I let my little sister pick the potential spouse theme for this generation and just made the Sims accordingly so I hope they turned out ok.
First up this time is eldest daughter of Wren and Brasher and twin to Xhasca; Xanthe. 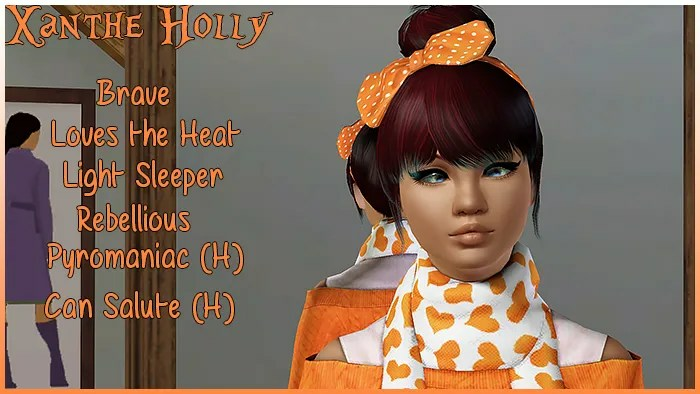 Traits: Brave, Love the Heat, Light Sleeper, Rebellious, Pyromaniac (H), Can Salute (H). After Xanthe, of course we have her twin and youngest of Wren and Brasher’s kids; Xhasca. Traits: Hates the Outdoors, Virtuoso, Neat, Loner, Pyromaniac (H), Can Salute (H). 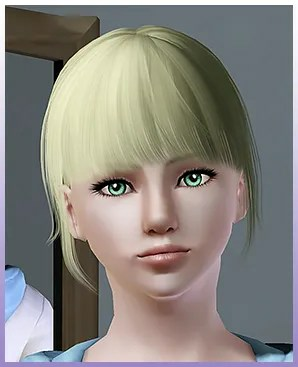 After Xhasca we have Yuki, the eldest of Wren and Nyx’s kids and the prettiest sim ever born into my game, ever! Traits: Brave, Friendly, Shy, Good, Pyromaniac (H), Can Salute (H). After Yuki we have the eldest boy of the generation, Zero. 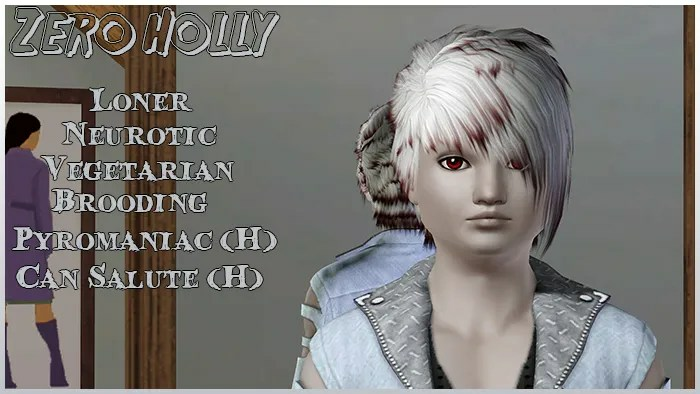 Traits: Loner, Neurotic, Vegetarian, Brooding, Pyromaniac (H), Can Salute (H). And finally, we have the baby of Generation 8, Zuko. 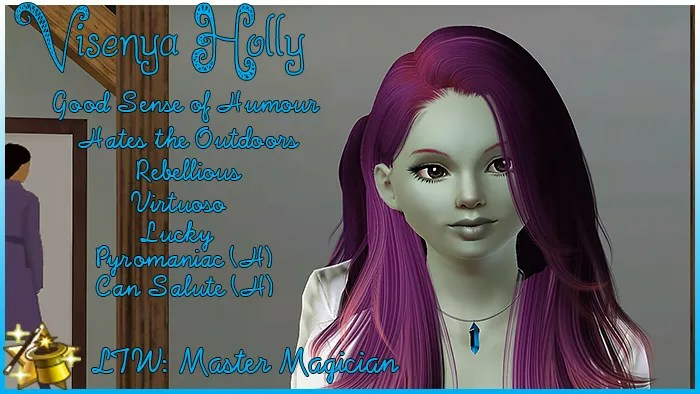 Traits: Hydrophobic, Light Sleeper, Night Owl, Socially Awkward, Pyromaniac (H), Can Salute (H). 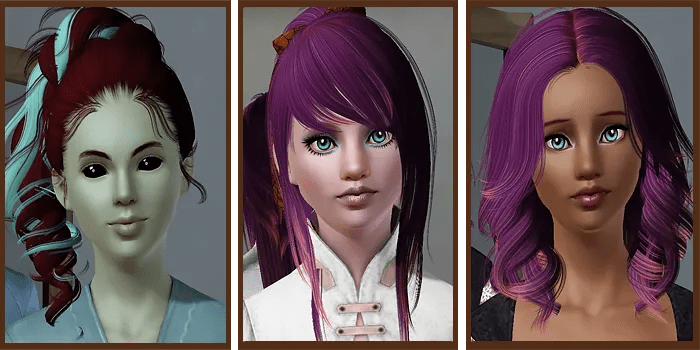 Oh, as suggested I’ve added an option to the poll for dual heirs with Yuki and Zero since you guys seem to like them both so much. I hope you all have a lovely New Year and I’ll see you in just over a week. Is it really that time again? It feels like the last heir poll was yesterday. 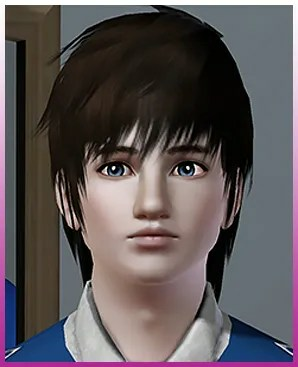 Maybe that’s because Shiloh’s generation was over pretty quickly (His first chapter was posted 6th Sept and his last was posted today 13th Oct)? Anyway, it’s time to move onwards to Generation 7 and one of Shiloh’s 3 daughter. I have more plans for some of the girls than the other but I really don’t mind at all which girl leads the next generation since I love them all. I am going to let this poll run for a week whilst I’m away (I’m away 14th – 21st) so hopefully we have a clear winner for me coming back. 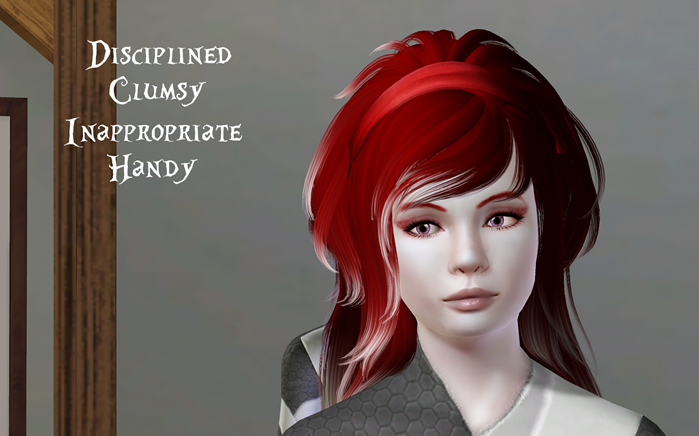 First up, of course, is oldest daughter Uxie. 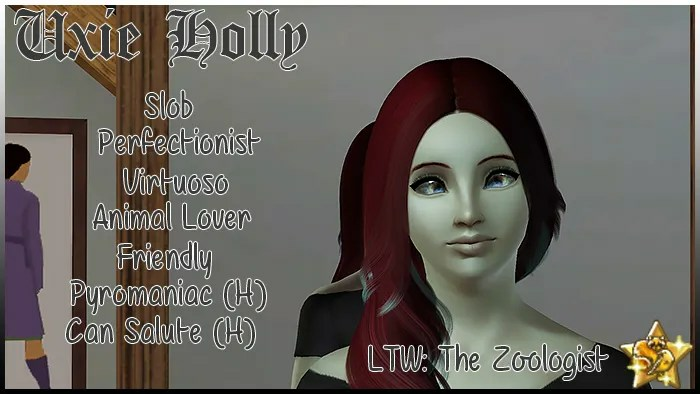 Traits: Slob, Perfectionist, Virtuoso, Animal Lover, Friendly, Pyromaniac (H), Can Salute (H). After Uxie we have Visenya, the middle child, and most probably the best genetics mix of this generation. Traits: Good Sense of Humour, Hates the Outdoors, Rebellious, Virtuoso, Lucky, Pyromaniac (H), Can Salute (H). And finally, we have the baby of the family, Wren. 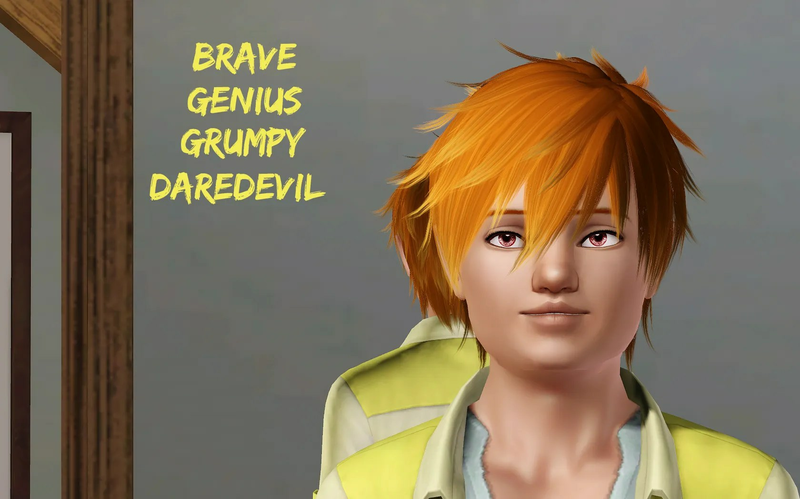 Traits: Unlucky, Family Oriented, Genius, Evil, Heavy Sleeper, Pyromaniac (H), Can Salute (H). Potential Spouses: Brasher Nieves (Wren’s IF) or Winter Bloesem (Visenya’s IF) or *drum roll* Nyx Alexander (who was the ‘big bad evil’ for Gen 7 of my only other legacy to reach Gen 7. It only seemed fitting tbh). And that’s it for the heir poll. Good luck with choosing because I could never make the decision. Also, do you guys see why I may have to make a spouse poll too depending on who is heir? Winter and Brasher screwed up everything with their flirting. Good luck with the voting, I’ll see you guys in a week. Ok guys, here’s the deal with this heir poll. I’ve decided to let 8 kids run this time ‘cause I’d already planned to do that in the first place before I knew there were 4 Marissa clones but in future if there is a clone then it will be excluded from the heir poll. Being super honest here I’d rather one of the clones wasn’t the heir since I’ve already planed through Marissa but if one of the clones are voted heir then I will accept that and play them as I would play any heir. With that in mind let’s get started. Also, I’m doing this heir poll slightly different with more pictures and stuff instead of me having to fail at descriptions. Let me know if you prefer this way or the old way. 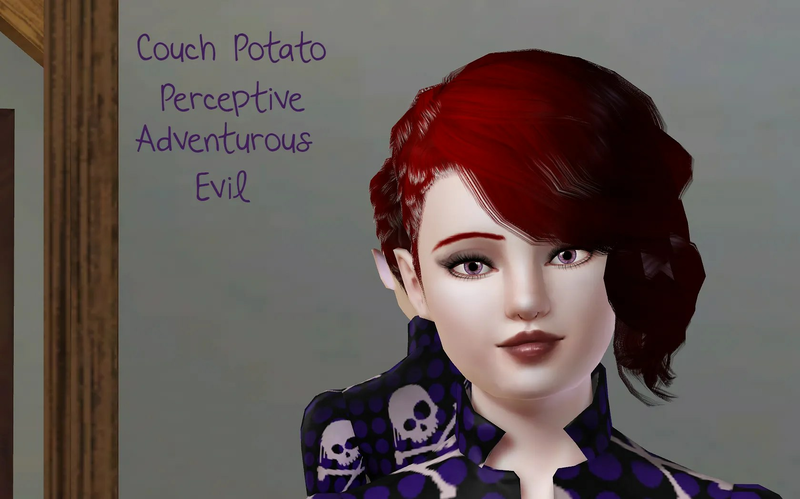 Persephone: Alien – Eldest Child of Marissa and Demir. Likes to paint but rolled an athletic LTW. 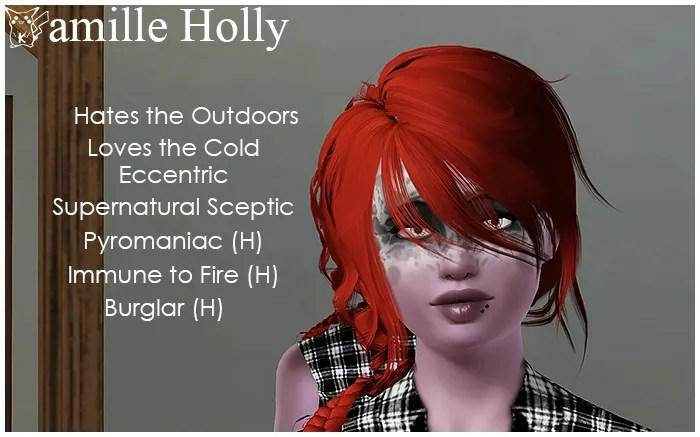 Traits: Pyro (H), Immune to Fire (H), Flirty, Neurotic, Good, Loves the Cold, Artistic. Genetics: For this part I’ve decided to just put the kids pictures side by side with their parents and you guys can see the genetic comparison for yourself. 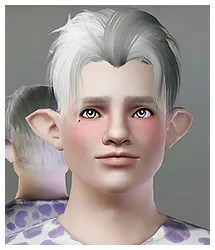 Also, for the girls I’ve made Demir into a girl for better comparison and for Roux and Shiloh I have made the mums into guys for the same reason. Also, I should mention that the kids with pure alien eyes have Marissa/Devan’s blue eyes underneath. Quinn: Alien – Eldest Child of Niska and Zen. 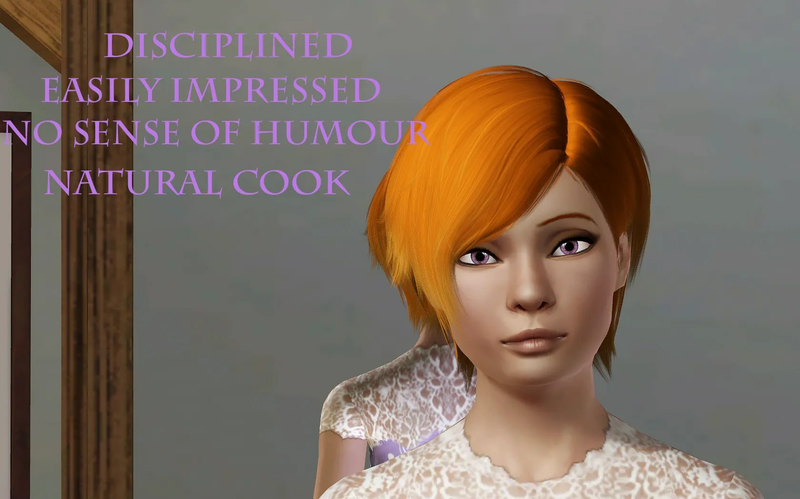 She hasn’t really developed a taste for any specific skill. 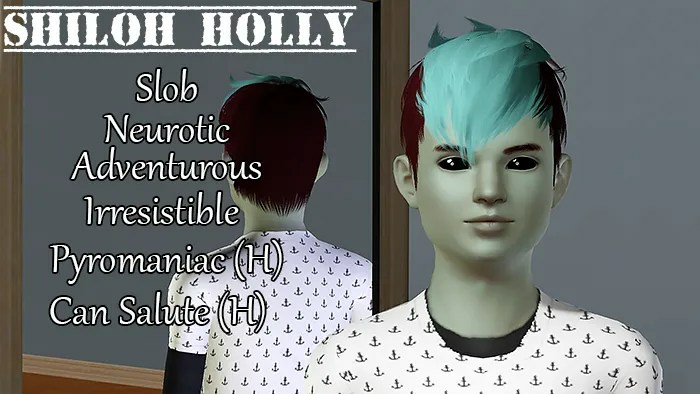 Traits: Pyro (H), Can Salute (H), Night Owl, Genius, Heavy Sleeper, Friendly, Computer Whiz. 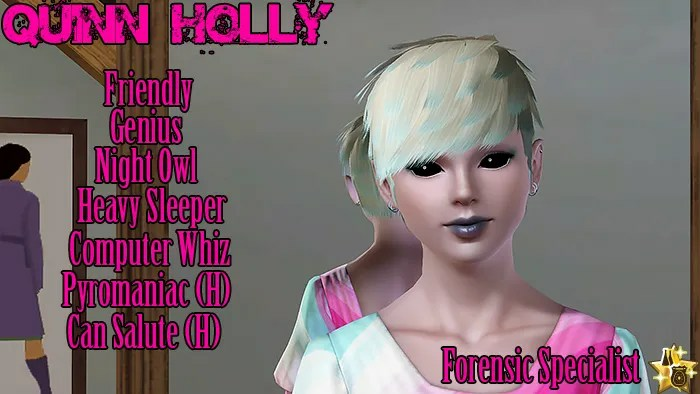 LTW: Forensic Specialist: Dynamic DNA Profiler. Potential Spouses: None as of yet. 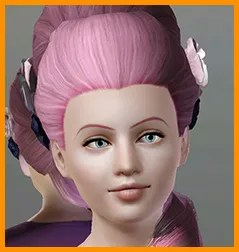 She is the only one of the kids where I just couldn’t find a spouse that fit so if she’s heir it will be spouse hunting for her. With the elder girls out of the way it’s time to move onto Marissa’s Quads. 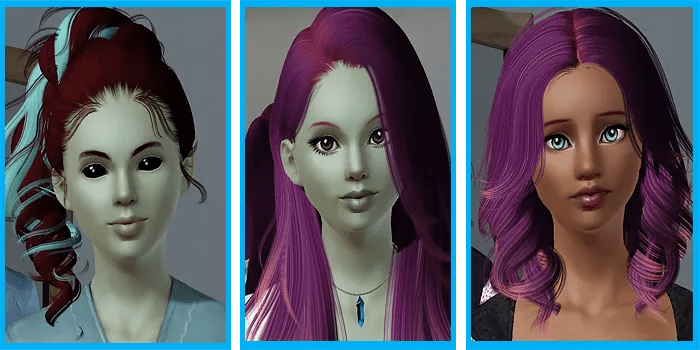 Rosa: Alien – Second Eldest Child of Marissa and Demir and Eldest of the Quads. Marissa’s favourite. 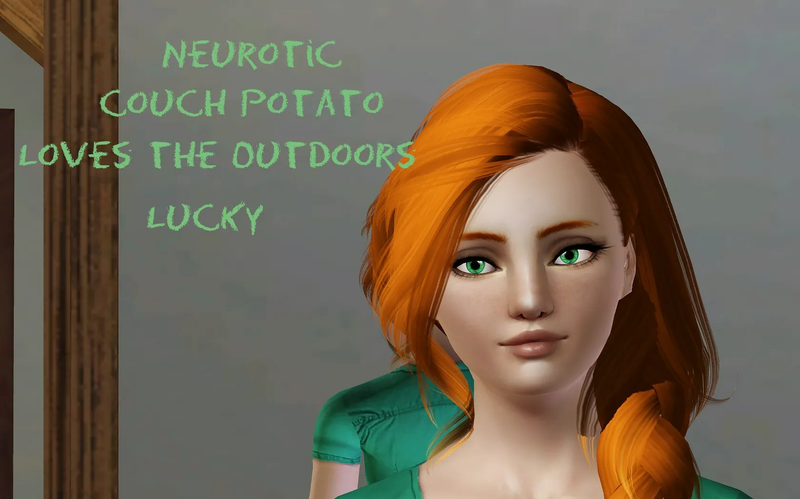 Traits: Pyro (H), Hates the Outdoors, Neurotic, Over-Emotional, Perceptive. 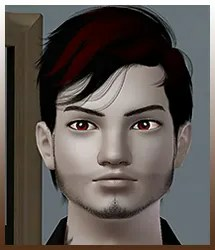 Rio: Alien – Third Eldest Child of Marissa and Demir and Second Eldest of the Quads. A non rebellious rebel. 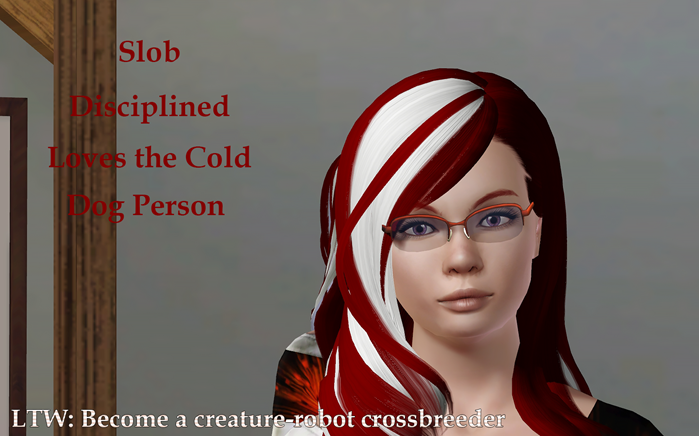 Traits: Pyro (H), Loves to Swim, Slob, Rebellious, Eccentric. 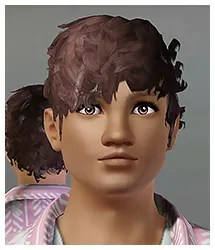 Roux: Alien – Second Youngest Child of Marissa and Demir and Second Youngest of the Quads. Loves playing with the instruments. 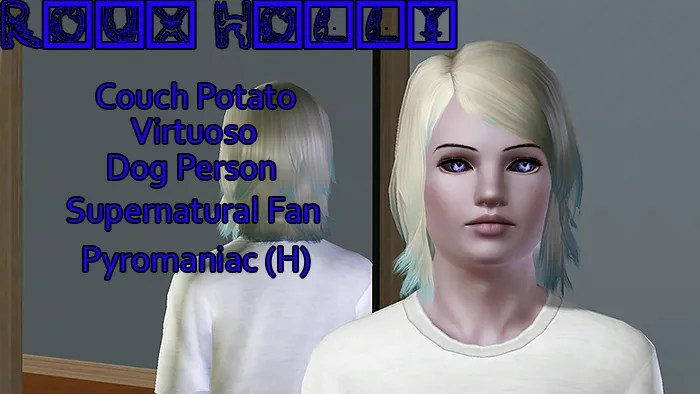 Traits: Pyro (H), SPN Fan, Couch Potato, Virtuoso, Dog Person. LTW: None yet but I foresee him rolling One Sim Band. Potential Spouses: Pagan Ross (Cousin to Rhaenys -Shiloh’s potential spouse- and also a Reaper baby). 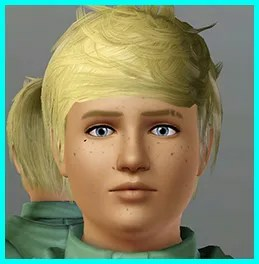 She and her cousin aren’t townies but Sims born into one of my undocumented legacy challenges. 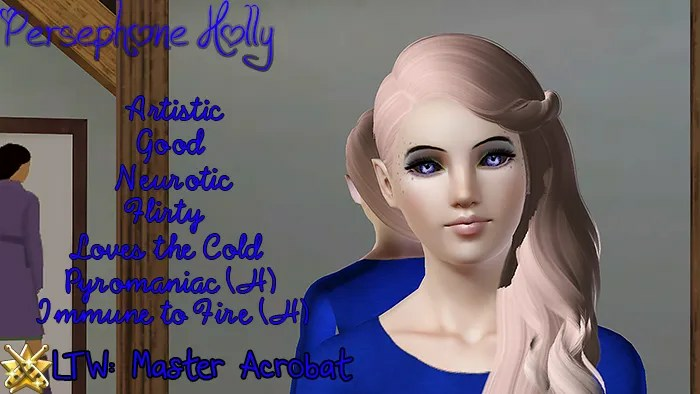 Rae: Alien – Youngest born to Marissa and Demir and Youngest of the Quads. She is very into Chess and Painting and has a very geeky personality in my head. 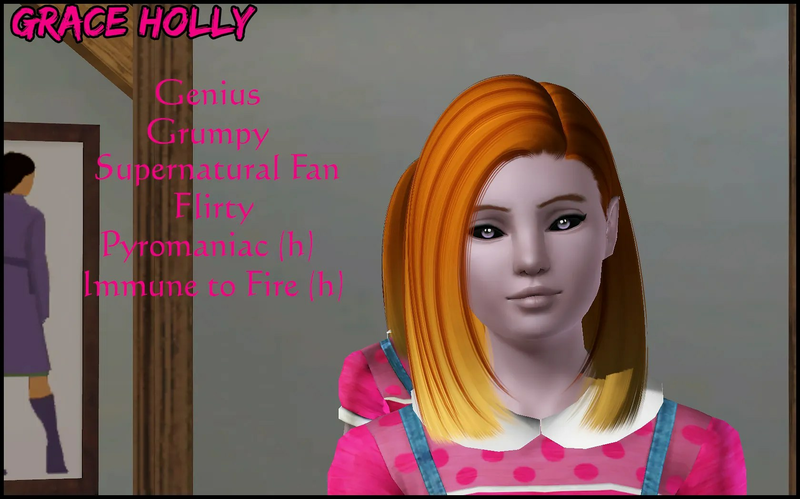 Traits: Pyro (H), Immune to Fire (H), Bookworm, Genius, Family-Oriented, Artistic. 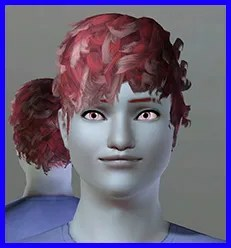 And finally, with the Quads out of the way it is time for the youngest of this Gen.
Sabine: Alien – Middle Child of Niska and Zen and Eldest of the Twins. Very creative minded, into things like painting and sculpting. 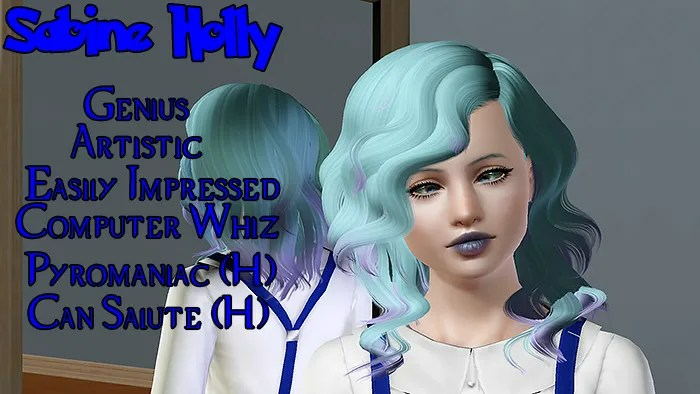 Traits: Pyro (H), Can Salute (H), Genius, Artistic, Easily Impressed, Computer Whiz. 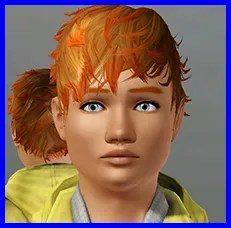 Shiloh: Alien – Youngest Child of Niska and Zen and Youngest of the Twins. He hasn’t really shown any interest in any specific skills yet. Traits: Pyro (H), Can Salute (H), Neurotic, Slob, Adventurous, Irresistible. And that’s it for this heir poll. 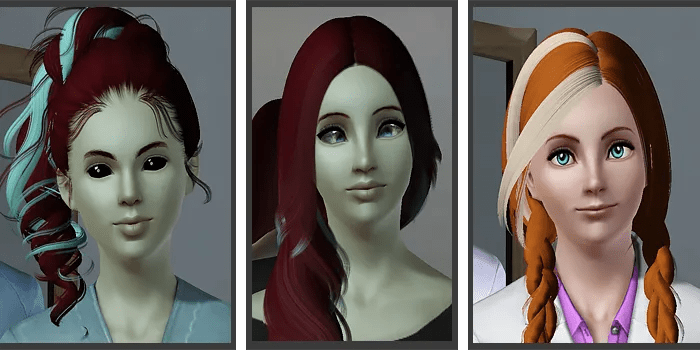 Choose carefully because there are so many options this generation (which is why I added the spousal options this time to make the decision easier). Good luck with the vote because I definitely couldn’t make this decision. The Poll will run from today until Friday 4th Aug because I’m going away to Spain in 2 days for a week. Hey guys and welcome to our first heir poll. I can’t believe that I’ve made it this far, I normally give up in legacies by now. Anyway if you haven’t read the latest chapter which only came out just before this then go ahead and read it, I think you will get a much better idea of the kids personalities. It’s here for anyone who wants to read it. 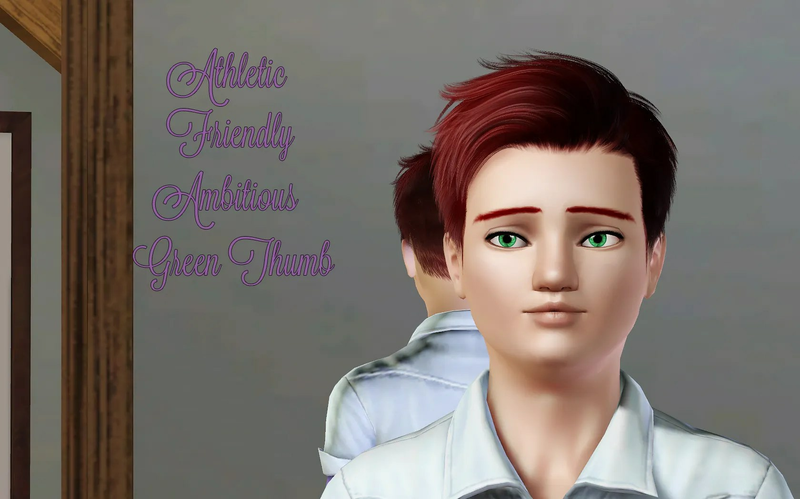 Let’s start of with Ayden, the oldest and only boy of Peppermint and Ivan’s kids. 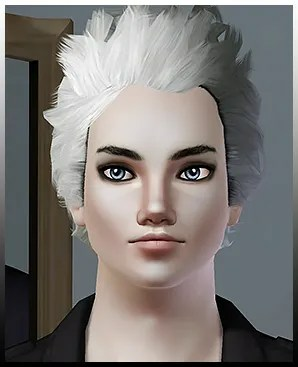 He was pretty much doomed from the start after being born with the evil trait combined with his crappy parents but he’s got an awesome personality and I really like following him around. 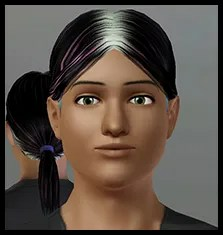 Potential spouses: Frieda Salas, Ada Winchester or if those two don’t work out I’ve got another surprise sim lined up. 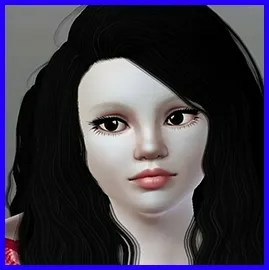 Next up is Alyssa, Ayden’s twin sister and eldest girl. She has been pretty boring thus far but she did develop some personality in the last chapter. She is the only one of the kids to roll a LTW so far (It also doesn’t hurt that it goes along with the geeky image of her I have in my head). Potential spouse: Gerald Sung-Lau (This one is for definite since she’s already rolled to move in with him). And lastly we have Bay, the youngest out of all the kids. She hasn’t really had her chance to shine since she only became a teenager at the end of the last chapter but I couldn’t wait any longer. Like her older brother Bay also hasn’t rolled a LTW and with her random traits I’m not sure what she will roll upon aging up. 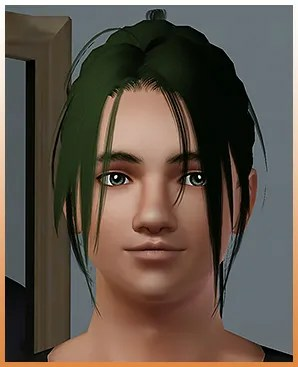 Potential spouses: I’m not quite sure yet because she has just aged up but maybe Frieda Salas’ younger brother Jay (who is also a ghost) or if that doesn’t work out the surprise sim I have waiting for Ayden.